When the Civil War ended, leaders took on the task of rebuilding or reconstructing the nation. One important issue was the right to vote: would the franchise grow to include four million former slaves? 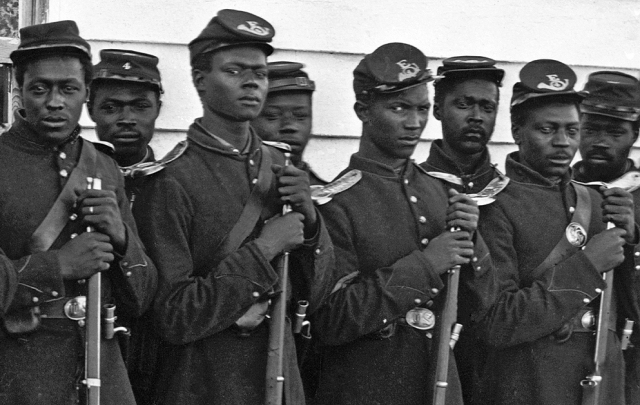 African Americans “deserved” the vote in recognition for their military service and loyalty to the Union. Voting was a “natural” right of all men, and would be a means of educating Black men and improving the common good. African American voters would limit the political and economic power of former Confederates (and Democrats) both regionally and nationally. At first, President Abraham Lincoln’s Reconstruction Plan did not require southern states to give African Americans the vote. However, he did suggest that those who had fought in the Civil War or had served the country in other ways had earned suffrage. In 1864, free Black men in New York formed the National Equal Rights League (NERL). They argued that African American service in the Revolutionary and Civil Wars entitled all Black males to vote and all Black men and women to full citizenship. In 1919, Congress passed an act that granted citizenship to the 7,000 American Indians who served in the armed forces during WWI and received an honorable discharge. However, this did not guarantee them the right to vote.